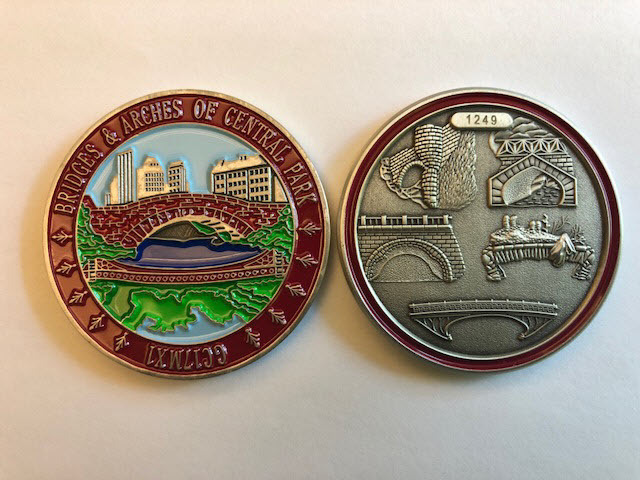 While not a GeoTour or a reward geotrail, the Bridges & Arches of Central Park (GC17MX1) is on the list because there is a reward for finding it. It was also awarded Geocache of the Week honors in 2015. This cache was high on my target list when we visited New York City last month. When finished, I added another favorite point to the pile. It was a really fantastic way to see a high percentage of Central Park. There are 32 stages to visit. We started at the north end of the park late in an afternoon and knocked out maybe the first 7-8 stages. I returned the next morning and was done with the remaining stages by around noon. (Keep in mind, I was running most of the way!) We found the final container later in the day. Each finder should find a geocoin to retrieve from the final container. (Non-trackable, but a very pretty coin). A trackable version is available for a fee by making arrangements with the CO. Same exact design on the two versions. This photo shows the front (from my trackable version) and the back from the non-trackable.